Women have been told that bloating, cramps and moodiness are “normal” side effects of their monthly menstrual cycles. It’s shocking and sad to me how many women come to me describing the pain they endure each month before and during their periods. Some have cramping so severe they take handfuls of painkillers or stay home sick from work. Some have bleeding so heavy they soak super tampons every hour or less. The majority are told the only solution to reduce their pain is to take birth control pills. (read my thoughts on the pill here). Some women choose the option of taking a continuous dose of hormonal birth control to suppresses a period altogether. The amount of artificial estrogen introduced by a steady supply of hormonal birth control may contribute to estrogen-dominant cancers or infertility, and the list of side effects cause by birth control pills is staggering. 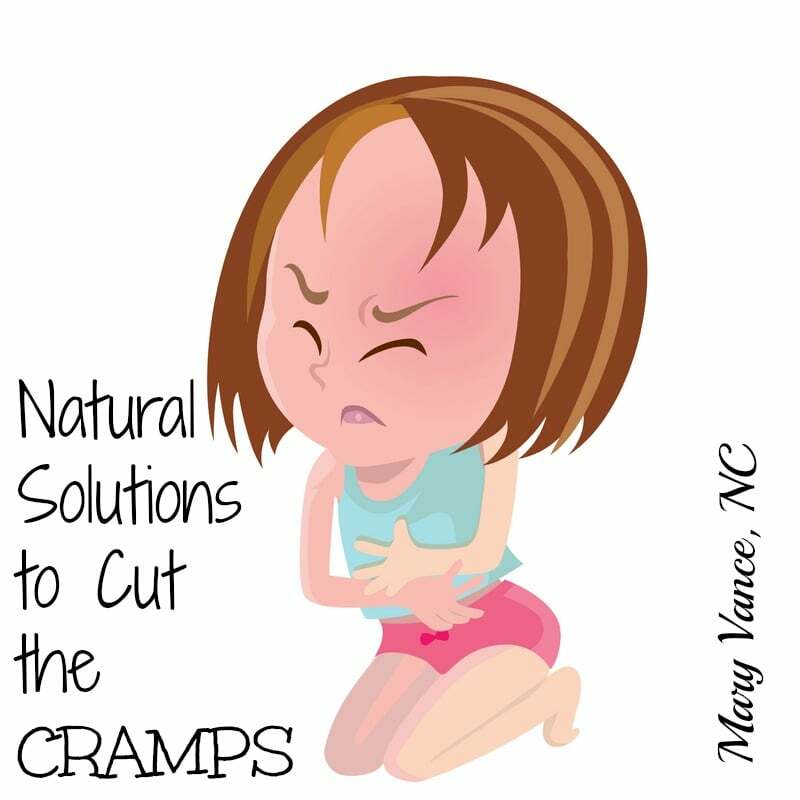 There are natural solutions to cut the cramps. Bonus: these solutions help reduce PMS symptoms, too. While some slight, temporary cramping or discomfort may accompany your period, debilitating pain is not normal. Bad cramps or painful cycles are referred to medically as dysmenorrhea. The main cause? Hormone-like substances called prostaglandins, which trigger muscle contractions so the uterus expels its lining each month. These contractions can cause pain and inflammation, especially if there is clotting. Women with higher levels of prostaglandins may experience more severe menstrual cramping (source: Mayo Clinic). Other causes of bad cramping are uterine fibroids, endometriosis, hypothyroidism, pelvic inflammatory disease, estrogen dominance/hormone imbalance, or having an IUD. I used to recommend IUDs for non-hormonal birth control, but I’ve heard so many bad accounts about the pain they cause that I’m starting to reconsider. (As an aside: I recommend reading Taking Charge of Your Fertility for natural birth control solutions). Hormone imbalance is a key cause of cramping and PMS symptoms. Estrogen dominance, which means there is too much estrogen in relation to progesterone circulating, is the main culprit and also contributes to fibroids, endometriosis, and hormonal cancers. Correcting estrogen dominance reduces cramping. I’ll discuss how in the solutions section below. Popping NSAIDS or pain pills may seem like the obvious solution to cramps, but pain killers have a bad effect on your digestive system and contribute to a sluggish liver. It’s so important to keep your liver tuned up, because your liver is in charge of metabolizing all your hormones and must clear excess estrogens so they don’t build up and cause problems. It’s best to minimize the use of any over the counter drugs. These tips will help you minimize use! Balance your hormones and reduce estrogen dominance. Weight loss (if you are overweight). Excess body fat can convert to estrogen. Reducing stress hormones will support hormone balance. skip the tampons and use a menstrual cup. I LOVE mine. Users say it greatly reduces cramping. The first step is to address your diet. Remove soy foods, which contribute to estrogen dominance; gluten, which causes inflammation; too much coffee and refined sugar; excess alcohol, which also contributes to estrogen dominance; and processed foods and refined vegetable oils that contribute to inflammation. Making these changes will also promote weight loss and therefore reduce your estrogen load. Increase anti-inflammatory omega 3-rich fatty acids foods such as wild salmon, sardines, walnuts, chia seeds and leafy greens to reduce inflammatory prostaglandins. Fiber-rich foods like berries, lentils (if you digest legumes ok) and veggies of all kinds will help bind up excess estrogen and assist in their excretion. Cruciferous veggies such as broccoli, cauliflower, kale and collards are rich in indole-3 carbinole that helps estrogen detox. Add magnesium and calcium-rich foods, too, such as root veggies, broccoli, salmon, sardines, spinach and sea veggies. I typically recommend extra magnesium to relieve cramps. Hormone Balance: Reducing stress will help because excess cortisol causes a decrease in progesterone which promotes estrogen dominance. Taking herbs like GAIA adrenal support will promote healthy cortisol levels, and wild yam and vitex boost progesterone. Make sure you are getting 7-8 hours of sleep and engage in stress relieving activities if stress is taking over your life. It doesn’t mean you have to meditate for an hour a day; acupuncture, gardening, or tai chi will help. Click here for my 4 easy tips to balance your hormones right now! Give your liver some love. Your liver is your hardest working organ, and a healthy, happy liver means balanced hormones and proper estrogen detox. Poor diet, medications, cosmetics, pollution, conventional meat & produce, cleaning products and alcohol all contribute to liver congestion. Click here to download my easy 21-day liver detox e-book filled with guidelines to help. I describe the best supplements to support liver detox in the book. I also include plenty of resources to help detox your home cleaning products & cosmetics. Magnesium relaxes muscles and reduces cramping. DIM supplements can help the body clear excess estrogens. Reducing menstrual cramps and balancing hormones is a full body project: reducing stress hormones and supporting adrenals will positively impact estrogen and progesterone; supporting healthy gut flora and good digestion will insure you absorb all the nutrients you need from your food; supporting liver detox means you assist in clearing excess estrogen; and of course, a nutrient-rich whole foods diet supports it all. Thank you so much for posting this! My periods have always been painful but in the last few years they have gotten way worse. Usually it hits in the morning and for the first half of the day, I can barely move. Also, during an exceptionally bad one, I can soak through a super in about 2 hours. As per another blog, I think it was WellnessMama, I have been taking red raspberry leaf and chasteberry extract capsules. They don’t work perfectly but they take the edge off so I can function! What would you suggest for breast pain? Iodoral iodine supplement, evening primrose (GLA), and wild yam extract. I’m in my late twenties, 130 lbs, and hardly bleed at all. Sometimes I don’t even have to wear anything at all for the entire 4 day period- just wiping here and there. But, day 1 & day 2 put me totally out of commission. Bedridden. Nearly hospitalized by the pain. But only for the last 1.5 years. Can you say ANYTHING about this to lead me into the right direction for what to do or your thoughts? I can’t comment on this unless you are a client of mine, but I would start by measuring your cortisol, estrogen, and progesterone levels to see if anything is off balance. Hello, I went in to menopause at around 38-39 and then got pregnant but it was ectopic pregnancy. Hospital injected me with methatroxate so the featus melts wherever it was and that led me to full menopause. I really like to have another baby and don’t know if there is a chance to balance back my period/ hormones. Help? Anything can be done? Hi Tina, I’d recommend working with a naturopath or functional medicine dr.
Love your article but would caution about Ginger. I learned by accident that its highly estrogenic. I had the most debilitating cramps that month painkillers did nothing and my period lasted for 14 days. My periods are already very painful but manageable w advil but that month was excrucitiating. I was eating a lot of it in my smoothies as a way to cleanse. I would tell them to go light on the ginger. I check everything for estrogenic properties now. Dim is wonderful, however and all else in your article is great. Thx! Hi Kym, thanks for your comment. I have never heard that about ginger, and there are no studies confirming that is it estrogenic. Do you have a reference for that information? It could be that it was not an ideal solution for your particular physiology, but there isn’t information confirming that ginger raises estrogen. In fact, it may improve hormone levels and stimulates liver detox which also improves estrogen balance.